Produktinformationen "FriendlyELEC NanoPi Neo4 - 1GB Ram Dual-Core A72/ Quadcore A53 64-bit ARM Board RK3399"
The NanoPi NEO4 is a RK3399 SoC based ARM board. Its PCB size is only 60 x 45 mm and has rich hardware resources. These features make it a good platform for rapid product prototyping and various applications. 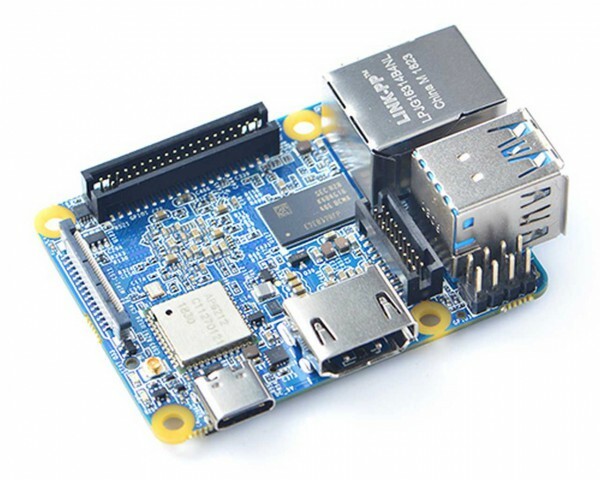 NanoPi NEO4 has 1GB RAM, an onboard 2.4G wireless module, and rich hardware resources, such as USB3.0, USB2.0, PCIe, GbE, HDMI, MIPI-CSI, eMMC socket, SPI, GPIO, I2C, PWM, RTC, UART, etc. NanoPi NEO4 can be booted from either a TF card or an external eMMC module. The NanoPi NEO4 supports Ubuntu Desktop 18.04(64-bit), Lubuntu 16.04(32-bit), Ubuntu Core 18.04(64-bit) and Lubuntu Desktop with GPU and VPU acceleration. With these rich resources and powerful performance it can be widely used in applications of machine learning, AI, deep learning, robots, industrial control, industrial cameras, advertisement machines, game machines, blockchain and etc. Weiterführende Links zu "FriendlyELEC NanoPi Neo4 - 1GB Ram Dual-Core A72/ Quadcore A53 64-bit ARM Board RK3399"
Kundenbewertungen für "FriendlyELEC NanoPi Neo4 - 1GB Ram Dual-Core A72/ Quadcore A53 64-bit ARM Board RK3399"